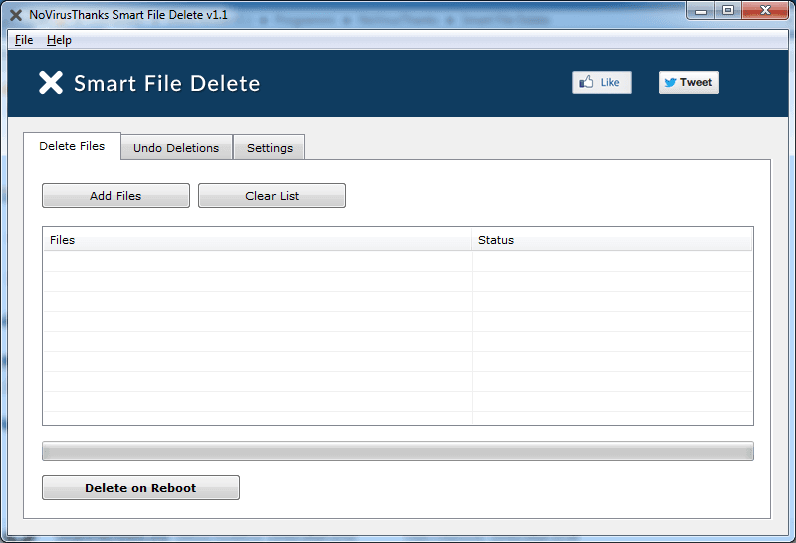 NoVirusThanks Smart File Delete is a simple Windows OS software application that can safely delete locked files and hard-to-delete files, by marking the files for deletion on the next reboot. In some cases you can delete locked files by terminating the programs that use that specific files, however this is not always safe and can create problems. With this program you can safely delete files on the next reboot, including files that cannot be deleted because they’re in use or locked by other programs. The usage is very simple, just select the files you want to delete, eighter via the button “Add Files” or via “drag & drop”, and click the button “Delete on Reboot”. Later, when you reboot the system, the files will be deleted. Moreover, you can view the content of the PendingFileRenameOperations REG_MULTI_SZ registry value (on the tab “Undo Deletions”), that stores the names of files to be deleted when the system restarts, so you can also easily “undo” files deletion operations. Safely delete hard-to-delete files on the next system reboot. View the content of PendingFileRenameOperations value. Undo file deletions by removing the mark on PendingFileRenameOperations. Delete malware files that cannot be deleted using the traditional methods. Support “drag & drop” functionality for multiple files, easier to delete files. You can select files to delete through the Windows explorer context menu.